Today, the consumption of plastic is going unprecedented over the past two decades. It is because plastic has been playing an important in many aspects of our daily life. Plastic is used in many products like- protective covering, safety components in mobile phones, insulation materials in buildings, furniture items, and in the medical industry. And because the decomposition of plastic is pretty much hard, the amount of plastic waste in our surroundings is increasing rapidly. Our seas also contain articles made of plastic. Undoubtedly, plastic has always been the most objectionable kind of litter and can be seen for months without degrading substantially. After PET plastic containers are collected, they sort and prepare or sale. The amount and type of sorting and processing is entirely depend upon the specifications laid down by the purchaser. It also depends to the extent to which consumers separate recyclable materials of different types and remove contaminants. Then the process of recycling begins with the collected bottles when the material delivered to the facility. The process of sorting and grinding is not sufficed in preparation of PET bottles and containers for re-manufacturing. The further process is required to remove many items physically attached to the PET bottles and containers. These items are plastic cups, labels, and carbonated beverages. Then the dirty regrind is processed in the form suitable for the container. This processed dirty flake then go through many processes of sorting and cleaning to separate PET from other materials. First, regrind material is passed through an air classier to remove lighter materials then the PET like paper labels and fines. A special detergent will be then used to wash flakes in a scrubber. This detergent washing is required to remove food residue on the hidden or inside surface of PET bottles and containers. Further, the flakes pass through a float/sink classifier. During this process, PET flakes, which are heavier than water, sink in the classifier, while base cups made from high-density polyethylene plastic (HDPE) and caps and rings made from polypropylene plastic (PP), both of which are lighter than water, float to the top. After the process of drying, the PET flakes pass through an electrostatic separator. This process produces a magnetic field to separate PEt flakes from any aluminium that present as a result of bottle caps and tennis balls, can lids and rings. After the completion of all these processes one by one, the PET plastic will turn as clean flake. In some of the cases, it is also evident that reclaimers will further process clean flake in a repelletizing stage. This process turns the flakes into the pellet. Then the cleaned PET flake or pellet is then processed by reclaimers or converters. This process transforms flake or pellet into a raw material of commodity grade, such as fiber, sheet, or engineered or compounded pellet. Then this finally sold to the users who are then responsible to manufacture new products through it. 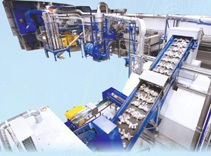 In some cases, reclaimers will further process clean flake in a “repelletizing” stage, which turns the flake into “pellet.” Clean PET flake or pellet is then processed by reclaimers or converters which transform the flake or pellet into a commodity-grade raw material form such as fiber, sheet, or engineered or compounded pellet, which is finally sold to end-users to manufacture new products. To conclude with, all discarded PET bottles collected from various sources. Then collected bottles are sorted, cleaned, shredded and converted into washed flakes. They are used to produce a variety of products, like polyester fiber which is further used as a filling material in cushions, pillows, and converted to many kinds of clothing, upholstery. Sometimes, quite a few times, it is used in the manufacturing of PET straps, monofilament, sheets, etc.